Deceptive site ahead is the PUP that uses misleading techniques to prevent removal. Use Reimage to locate malicious components and get rid of them faster than with uninstall instructions. A full system scan blocks virus reappearance and prevents traffic to malicious domains. 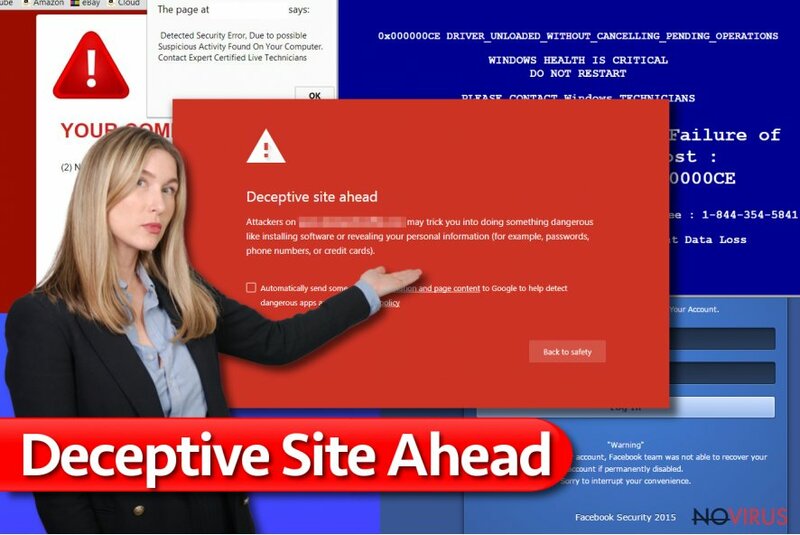 What is the meaning of "Deceptive Site Ahead” warning? How to bypass "Deceptive Site Ahead” warning? 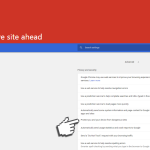 What is the meaning of “Deceptive Site Ahead” warning? This is how "Deceptive site ahead" warning looks like. It is meant to stop you before you enter a dangerous website. 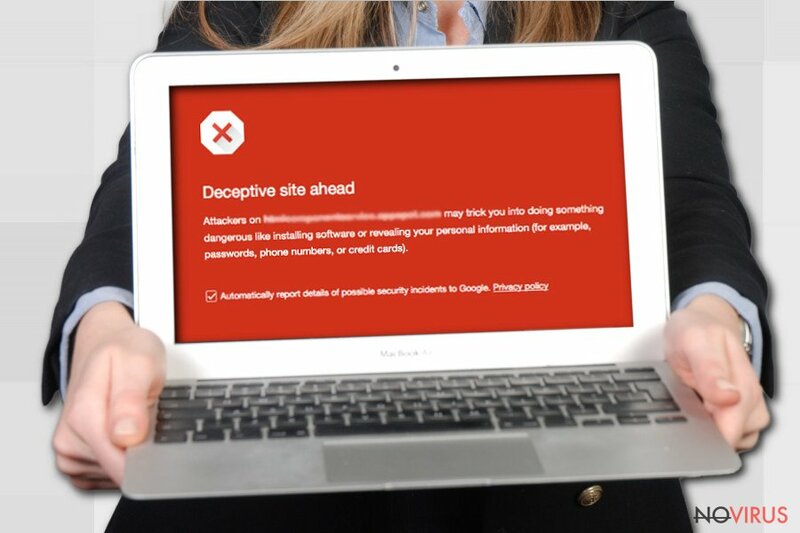 “Deceptive Site Ahead” alert is a useful message from your browser, saying that the website you are trying to access is dangerous. 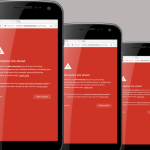 This alert is triggered by Google Chrome’s Safe Browsing technology, which detects and flags dangerous websites. 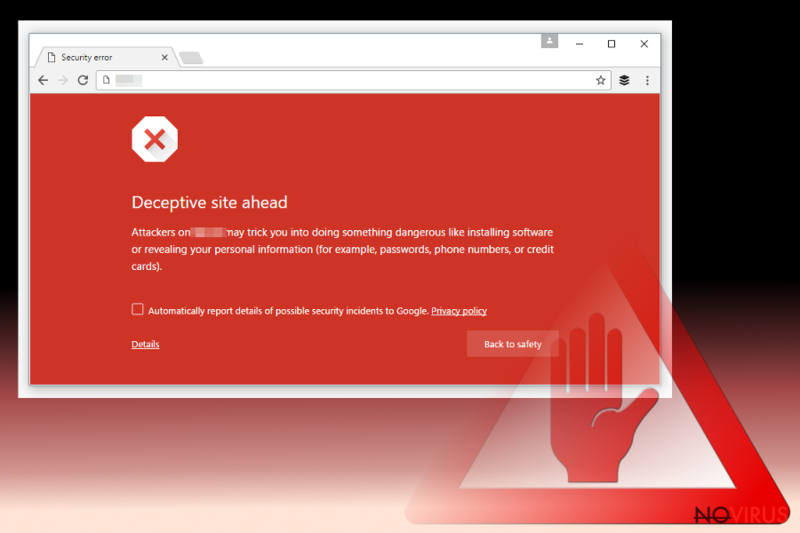 Mozilla Firefox browser also has a technology that identified dangerous Internet sites, but it displays “Deceptive site!” warning. The described warning means that you might be trying to access a phishing website or a site that uses social engineering techniques to trick users into doing something dangerous, for instance, disclosing passwords or sensitive data (credit card data, phone numbers, other personally-identifiable information), or installing dangerous software. Speaking of social engineering attacks, the new technology identifies websites that try to pose as trusted entity and trick you into revealing valuable information or calling a tech support assistant, who actually is a scammer. The technology also detects fake ads, misleading “Download” and “Play” buttons. 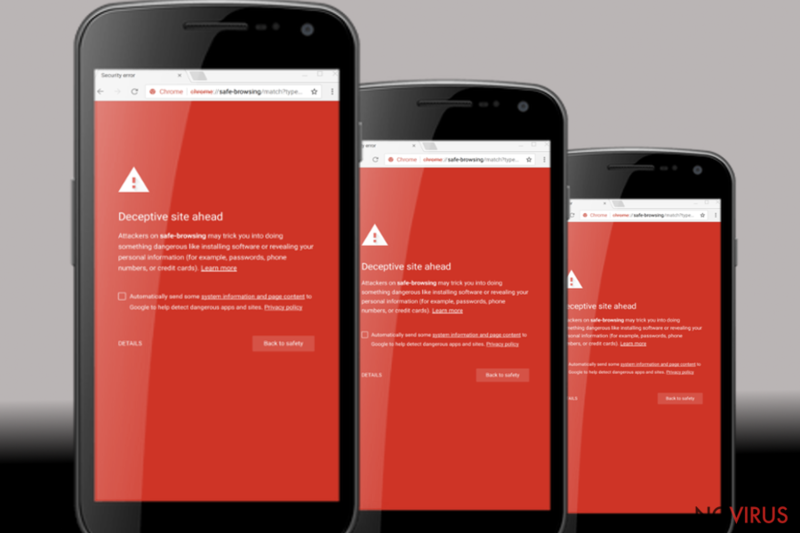 The “Deceptive Site Ahead” warning usually shows up on a interstitial all-red page, which suggests going back to safety and not visiting the website. Seeing this message doesn’t mean that your computer was compromised – it only warns that such things can happen if you decide to proceed and enter the shady website. Although it is highly recommended not to so so, you can still enter the potentially dangerous website, you need to click on “Details” > “Visit this unsafe site.” Of course, this warning doesn’t always mean that the website ahead is actually dangerous. It might appear before entering legitimate websites if they provide ads from a shady ad network. 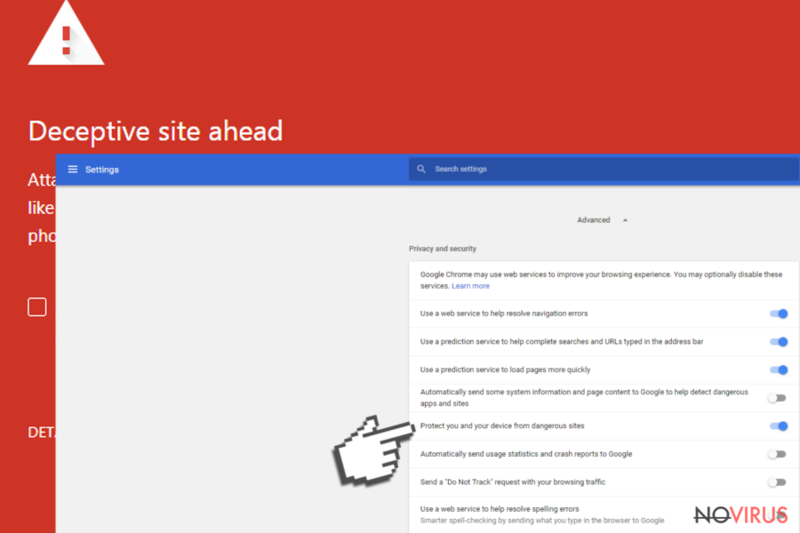 If you own a website and visitors have reported about the warning they receive when attempting to enter it, you should visit Google Transparency Report page and find out what kind of unsafe content your website hosts. To remove the warning message, the webmaster has to fix all of the issues that trigger the Safe Browsing scanner to show a red light and then request a review. You try to steal information about users. ThePirateBay is just one of thousands websites marked as a deceptive, and the list of such sites eventually grows. 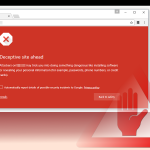 You might also start encountering similar warnings after being infected with Delta-Homes, Mysites123.com and other browser hijackers. You can also run into these warnings when trying to access sites that suggest illegal downloads such as pirated software or music. Finally, the described warning can try to stop you from entering a phishing website that tries to trick you into calling tech support scammers. However, the Safe Browsing technology is not flawless and there is definitely a possibility to enter dangerous websites without being warned first. Therefore, to prevent problems such as malware attacks, we highly recommend installing and using anti-malware software like Reimage. How to bypass “Deceptive Site Ahead” warning? If you do not want Chrome to display warnings about possibly dangerous websites, you can disable the feature that tries to stop you from entering them. Of course, we do not recommend you to do so. Disabling this option means you will never get warning before entering any deceptive website. If you still want to disable this feature, at least protect your PC with anti-malware software like Reimage. The tutorial for Chrome users is provided below. Go to Settings, scroll down the page and choose Show Advanced settings. Find “Privacy” section and remove the checkmark from the “Protect you and your device from dangerous sites” option. This post was published on 2019-04-01 at 03:40. Category: System tools, Viruses. What method did you use to remove Deceptive site ahead? Cannot remove Deceptive site ahead?